We’d love your help. 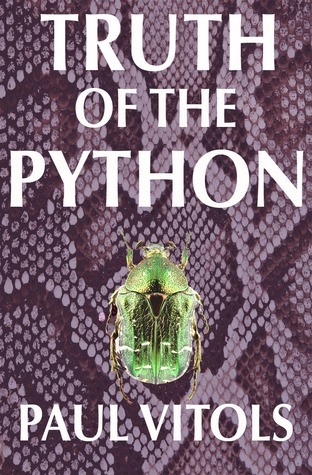 Let us know what’s wrong with this preview of Truth of the Python by Paul Vitols. On New Year’s Eve, 1990, Vancouver hypnotherapist Philip Dozier, while treating shy, neurotic science student Greg Brodie, inadvertently leads his client to a traumatic memory--from twenty-five centuries ago. In doing so, he opens a Pandora’s jar of life-changing consequences. For it emerges not only that Greg may have been the Greek philosopher Pythagoras, and Philip hims On New Year’s Eve, 1990, Vancouver hypnotherapist Philip Dozier, while treating shy, neurotic science student Greg Brodie, inadvertently leads his client to a traumatic memory--from twenty-five centuries ago. In doing so, he opens a Pandora’s jar of life-changing consequences. For it emerges not only that Greg may have been the Greek philosopher Pythagoras, and Philip himself a key figure in that remote time, but that Greg, in trance, can act as a channel--someone who gives voice to nonphysical entities. And an entity appears who has knowledge of a painful secret from Philip’s past. Can Philip redeem himself--or even control himself? What will Greg do if he discovers that his supposed therapist has been using him? Maybe the great philosopher was right: we’re all doomed to repeat events from long ago, and we can’t escape no matter how hard we try. Truth of the Python is a literary thriller, a thought-provoking story of suspense, mystery, and meaning. To ask other readers questions about Truth of the Python, please sign up. This was both an emotionally and intellectually exciting read for me. Like Greg at the beginning of this novel, I am far too earth-bound to imagine myself as the reincarnation of an historical figure (or any other being, for that matter). My tendency to the prosaic notwithstanding, I feel that the idea makes an excellent premise for a story. But I attach a caveat: it is a premise which deserves the right kind of treatment. Happily, while reading this book I felt myself to be in suitably capable This was both an emotionally and intellectually exciting read for me. Like Greg at the beginning of this novel, I am far too earth-bound to imagine myself as the reincarnation of an historical figure (or any other being, for that matter). My tendency to the prosaic notwithstanding, I feel that the idea makes an excellent premise for a story. But I attach a caveat: it is a premise which deserves the right kind of treatment. Happily, while reading this book I felt myself to be in suitably capable storytelling hands. I found the cast of characters to be rich and believable. Very importantly, I cared what they were up to. The main players occupy a range of positions on a continuum of conflict; ethics are pitted against sleaziness and pure experience is in tension with the capacity to reflect. The portrayal of these struggles felt very real. For example, witnessing how Philip's growing preoccupation with his past deeds causes him to become ever more inward-looking prompted feelings of dismay, exasperation and an uncomfortable shiver of recognition. I especially liked the way these conflicts extended through many centuries and dimensions, in fact right into the realms of the supernatural. The interactions between gods and mortals adds another layer, a sense of the epic. Despite the many transitions between different places and times, the writer succeeds in locating us, the observers, firmly in 1990s Vancouver. This is a delightful bonus and somehow manages to seem a perfectly reasonable location for the reincarnation of an ancient Greek philosopher and mathematician. And the backdrop to those times - the first gulf war - once again reaches out to us in our present. In this context the eternal recurrence of events starts to look increasingly plausible. This book is described as a literary thriller, and with the book having a historical element it caught my attention. Set in Vancouver in the early 1990s hypnotherapist Philip Dozier is treating university student Greg Brodie for an embarrassing personal problem. During the course of their sessions Greg regresses 25 centuries and it seems in a previous life he was Greek philosopher Pythagoras. He also acts a channel for a being that knows Philip's secrets. Both men become obsessed with the past, This book is described as a literary thriller, and with the book having a historical element it caught my attention. Set in Vancouver in the early 1990s hypnotherapist Philip Dozier is treating university student Greg Brodie for an embarrassing personal problem. During the course of their sessions Greg regresses 25 centuries and it seems in a previous life he was Greek philosopher Pythagoras. He also acts a channel for a being that knows Philip's secrets. Both men become obsessed with the past, Greg convinced he is on earth to continue Pythagoras' work and Philip concerned about his historical connection with Greg and repaying karmic debts. This is a well written book that covers some very interesting territory. I particularly liked a lot of the parts set around 500BC, reading about the different civilisations, their religious beliefs and the life of Pythagoras. I also found the present narratives enjoyable, and felt a degree of concern for Greg. However I found it hard to warm to therapist Philip, especially as his behaviour became less moral, and although she wasn't a major character I felt more empathy for his wife. While I was keen to read on to find out how the men were linked, and to discover more about the entity Greg channels there were parts that were overly philosophical for me. It's not a topic I know a great deal about, I found myself a bit out of my depth and those parts dragged a little for me. I was happier once I got back to the more straightforward accounts of the past and present. Overall though the style, while it had a literary bent, didn't make for a hard read. When hypnotherapist Philip Dozier attempts to find the source of an embarrassing medical condition in a young patient named Greg Brodie, he is alerted to the presence of an entity being channeled through Brodie. The presence of this entity and his message awakens a thirst in both Dozier and Brodie for a glimpse deeper into this mysterious other world. Now the clues begin to fall throughout this story, leaving a breadcrumb trail to the heart of the labyrinth. The trail is a mystical journey into t When hypnotherapist Philip Dozier attempts to find the source of an embarrassing medical condition in a young patient named Greg Brodie, he is alerted to the presence of an entity being channeled through Brodie. The presence of this entity and his message awakens a thirst in both Dozier and Brodie for a glimpse deeper into this mysterious other world. Now the clues begin to fall throughout this story, leaving a breadcrumb trail to the heart of the labyrinth. The trail is a mystical journey into the far distant past and it is a journey fraught with peril, the lure of sexual misadventure, and the awakening of consequences of choices and past actions being lived out in present life. This engaging story lingers on in consciousness once finished and even serves as an introduction to the value of contemplating motives, compulsions and often unexplained actions in present time. One is left with a desire to understand, embrace or reject these unseen forces in life which emanate from a mythical past. I can't pretend to understand all of the symbolism and mythological treasure buried in this story and it will take another read to dig deeper into it. Nevertheless, this is a well written story, very visual and enjoyable for that alone. Paul Vitols ("Vee-tolls"--Latvian for "willow") was born in 1959 in Vancouver, Canada, to two refugees who met at an encyclopedia salesmen's Christmas dinner. He showed an early obsession with letters and words, which manifested in, among other things, the defacing of some of his father's books. In school he turned to filmmaking, and competed in provincial and national student film festivals. Nonetheless, the career he imagined for himself was in space science. But by age 20 he realized that, for better or worse, he was a writer, and he dropped out of university. Paul's love of film led him into scriptwriting, and in 1992 he, with writing partner Warren Easton, broke through with a children's TV series called "The Odyssey," about a comatose 11-year-old boy trapped in an alternative world run by children as a police state. The show, known for its edge and humor, received many international awards and was broadcast in more than 50 countries. At the same time, Paul was also at work on a novel, a literary thriller called "Truth of the Python," in which a hypnotherapist inadvertently regresses a neurotic young client to a past life as the Greek philosopher Pythagoras. Paul, after some close calls in the world of print publishing, finally brought it out as an e-book in 2011. His current project is The Age of Pisces, an epic of the birth of Christianity, which he is calling a "literary series"--the e-book equivalent of a TV series. Episode 1, "The Mission," will appear before the dawn of the Age of Aquarius. Along the way, Paul has also practiced journalism, copy writing, editing, and technical writing. Indeed, to keep writing and creating he has also begged and borrowed, but not stolen--yet. He lives with his wife Kim in North Vancouver, British Columbia.